The Presidency on Tuesday said President Muhammadu Buhari's remarks when he received the report of the Tripartite Committee on the Review of National Minimum Wage was misinterpreted by the media. Mr Buhari had received the highly anticipated report from the committee's chairman, Amal Pepple, on Tuesday. 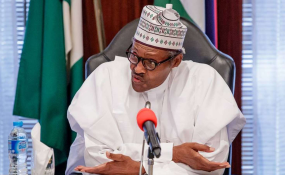 A presidential source, who preferred not to be named, said the president did not endorse N30,000 as proposed by the committee as reported by some sections of the media. "But the president's speech at the event was immediately made available to the media and nowhere indicated that the president endorsed N30,000 Minimum wage. "It is not the duty of the president only to endorse a new national minimum wage. The process involves the Federal Executive Council (FEC), the National Economic Council (NEC) and the National Assembly. "It is imperative for us to always avoid misinterpreting a written speech," he added. He said: "Our plan is to transmit the Executive bill to the National Assembly for its passage within the shortest possible time. "I am fully committed to having a new National Minimum Wage Act in the very near future." "Let me use this opportunity to recognise the leadership of the organised labour and private sector as well as representatives of State and Federal Governments for all your hard work. "The fact that we are here today, is a notable achievement. "As the Executive Arm commences its review of your submission, we will continue to engage you all in closing any open areas presented in this report. "I, therefore, would like to ask for your patience and understanding in the coming weeks." "May I therefore, employ workers and their leaders not to allow themselves to be used as political weapons," he said. In her remarks, Ms Pepple explained that the recommendation made by the committee was predicated on the high cost of living, occasioned by the exchange rate as well as the rising inflation rate in the country. She said the committee also considered micro-economic indicators including the revenue and expenditure profile of the government. Ms Pepple said the implementation of the recommended minimum wage would boost the purchasing power of the working class, increase consumption expenditure, and stimulate economic growth.